You’ve spent your career building your expertise. Now it’s time to build your platform to share your knowledge and experience. Remember these 5 tips to become a public speaker so you can grow your business while making maximum impact. You may not be ready to put together your first speaker reel yet, but you can create resources like your website and a one-page speaker profile, that shares your messaging and what benefit audiences have when you speak. Your materials must look professional and make it easy to see why someone should invite you to come speak. In addition, include relevant testimonials because social proof has a lot of value in the decision-making process for event planners. As you gain experience in your journey to become a public speaker, be mindful of how you can improve these assets. Have your presentation filmed when you can and get new testimonials from each event where you speak. Part of your marketing and visibility strategy should include ways to share your message that is free and easy to access. Social media makes this a readily available strategy for everyone. Whether it is through LinkedIn Articles or Facebook posts, give people a way to connect with you and learn about your expertise. Creating content gives you immediately credibility (as long as it is good content). It also allows you to create a relationship with the audience that will benefit from your messaging. An established and engaged following is another form of social proof. Start with small audiences or workshops and hone your skill as a speaker. Perfect not just your content, but how you deliver it as well. Ask for feedback from event attendees as well as meeting organizers. If you aren’t getting invited to speak at events yet- create your own event. There are a variety of free or low-cost options available from libraries to small hotel meeting rooms. Use resources like local community calendars and meet up sites to market your event. Be sure to tell your immediate network about your event so they know to come support you. If you don’t have any experience as a speaker but want to be a speaker- you need to create your own opportunities to become a public speaker. Throughout my speaking career, I have known many speakers who arrive just before their presentation and leave immediately after. My schedule does not allow me to be there for every minute of most events. However, I show both the audience as well as the event host that I am invested in adding value to their event through my participation. I arrive in time to meet with people who are there, and I leave myself time after events to speak with members of the audience who are interested in learning more about what I have shared. I make it a point to introduce myself and shake the hands of people who have come to hear me speak. 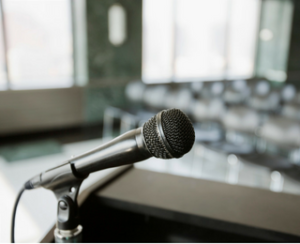 In your journey to become a public speaker, remember that you are there to be of service to the hosting organization and those who are there to learn. Make yourself available accordingly. Think of someone that you have learned from in your life. It might be a favorite teacher, a family member or a mentor. Chances are you remember how they made you feel more than anything. The best way your audience will connect with you and retain the lessons you share is by engaging them at an emotional level. In my talks, I share personal stories from my own life (including the difficult ones). I also shares stories of people who have changed their life by implementing the lessons that I teach. I also choose to use short and memorable soundbites for the lessons I feel are most important. Make it easy for people to share what you are teaching. If your audience can relate to just one of your stories or remember one of your soundbites, you will make a lasting impact. Speaking is a great way to build your credibility to the public in support of your business growth goals. It is also a lucrative income opportunity for speakers who establish a reputation of consistently delivering value. To become a public speaker, it is important to remember that at the end of the day, it is about how you are serving the audience and event hosts. Make it easy for people to see that you bring value and knowledge in an engaging and memorable way. Before you know it, you will be adding more and more speaking engagement to your calendar.